What is this public consultation about? What is in the public consultation document? A draft report describing the results of the assessment is being made available for public consultation prior to being finalised. The consultation period will last until Friday 3 February 2017. How will you use my comments? After the closing date, we will assess all feedback and use it to finalise our documents. The final documents and the Statement of Outcomes (a summary of the responses) will be published on http://www.hiqa.ie. 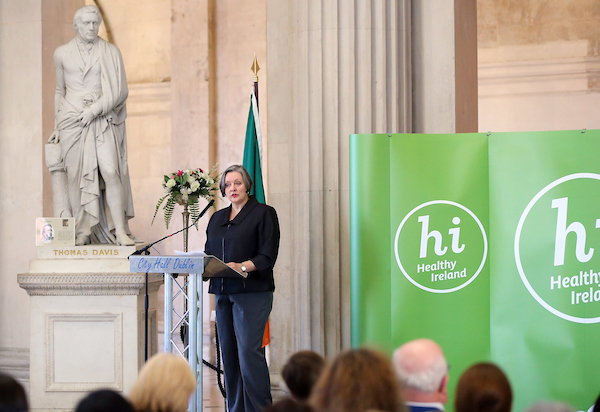 The Minister of State for Health Promotion, Marcella Corcoran Kennedy, T.D., formally launched the National Healthy Cities and Counties of Ireland Network on 29th Novemeber. The National Healthy Cities and Counties of Ireland Network was launched under the aegis of Healthy Ireland, the Government-led initiative which aims to create an Irish society where everyone can enjoy physical and mental health, and where wellbeing is valued and supported at every level of society. The Healthy Cities project is a global World Health Organization (WHO) movement, set up initially in 1987 with eleven individual cities. The concept is based on the importance of local action and the key role of local governments and Local Authorities in health and sustainable development. The Minister congratulated the Counties on making a commitment to work to become healthier places for all their citizens by working to implement Healthy Ireland, the National Framework for Improved Health and Wellbeing 2013-2025 and went on to say “as a former elected member of a Local Authority I know that Local Authorities are uniquely placed to bridge the gap between national policy and local implementation. I know the influence and reach that Local Authorities have in every community and I see huge potential for them to contribute to building a healthier Ireland. I believe that we cannot achieve the vision of Healthy Ireland without the involvement of every Local Authority in Ireland. Healthy Ireland is all about supporting and empowering communities and individuals to lead healthier lives and the involvement of Local Authorities and the Local Community Development Committees is critical”. Dr. Stephanie O’Keeffe, National Director of the Health and Wellbeing Division in the HSE said “the Healthy Ireland agenda is extensive. Improving our population’s health and reducing health inequalities spans across many areas. Our Local Authorities are leaders and critical partners in promoting and improving the nation’s health”. Dr. O’Keeffe also emphasised “the unique position of the Local Community Development Committees to understand and respond to local people’s needs”. The outcome of the Ninth Global Conference on Health Promotion (Shanghai, 21 to 24 November 2016), which was jointly organized by the Government of China and WHO, under the auspices of a Scientific Advisory Group and Conference Organizing Committee, is a concise Shanghai Declaration on Health Promotion. Promoting health demands coordinated action by all concerned, it is a shared responsibility. With this Shanghai Declaration there is a pledge to accelerate the implementation of the SDGs through increased political commitment and financial investment in health promotion. Applications are invited from suitably qualified candidates for a full-time, fixed term position as a Research Assistant with the Health Promotion Research Centre at the National University of Ireland, Galway. This position is available from January 5th 2017 to contract end date of September 28th 2017. The National Steering Committee oversees the delivery of a suicide prevention code of practice and training within the FRC programme. The committee also aim to support external partners in the development of their own Code. A new National Mental Health Promotion Framework for FRCs has also been developed which requires implementation. Westport Family & Community Resource Centre, as the host organisation for this position, wishes to recruit a National Co-ordinator to assist us in the delivery of the above work. This post is full-time (35 hours per week) and will be offered on a fixed-term basis for one year with the possibility of it being extended. The post will be based in the Westport office. The National Steering Committee consists of representation from the FRC National Forum, the National Office of Suicide Prevention, the Child & Family Agency, HSE Suicide Resource Officer, Mental Health, Primary Care and Health & Well-Being and Mental Health Ireland.